In order to recover your Google username using this form, you mustalready have specified a recovery email address or recovery phone number. If you haven't specified any recovery information, you may still be able to find your username if you have fairly recently accessed your email account through a browser. Gmail displays your email address in the browser's title bar, so searching your browser's history for Inbox or Gmail might reveal your email address. 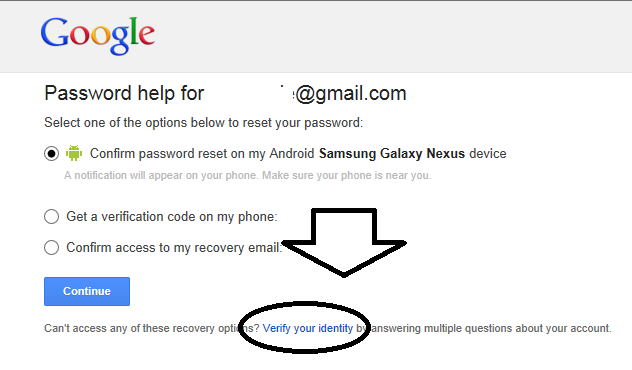 If you have an account on the Google Apps for Business service, you may still use the method described above. If this proves unfruitful, contact the administrator for your domain, who will be able to reset your password and/or find your username. First, try the methods described above. If this is unsuccessful, you may still reset the admin password by domain verification. If you have already set up an email client to fetch mail from your account, you might be able to extract the username / password from that client. You may still be able to restore access to your account by manually verifying your identity. If you are asked to enter the last password you remember, click I don't know. You will then be asked a series of questions which you must answer to the best of your ability. If you can provide enough accurate information, you will get your account back.